I've seen these tubes of polenta at the grocery store before, but never actually purchased them. When I've made polenta, I've used the dry stuff that you add liquid to, such as in polenta pepperoni pizza and mushrooms, caramelized onions, and spinach over creamy goat cheese polenta. The precooked stuff was all new to me, until Frieda's Produce sent me some to try out. 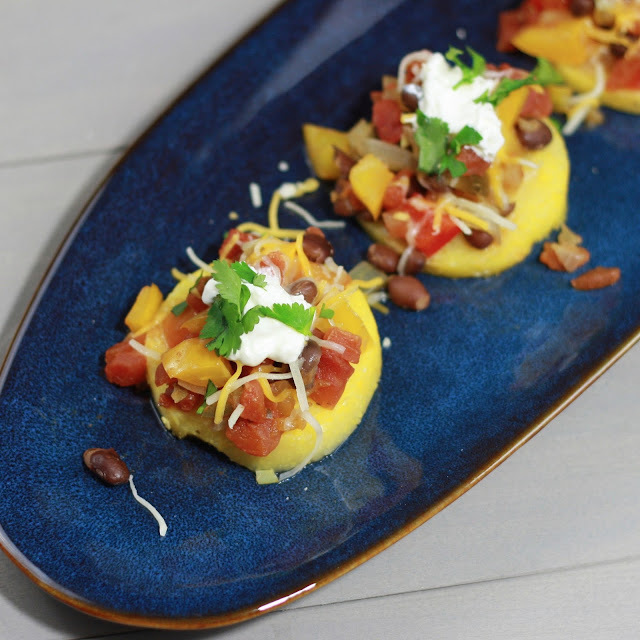 Don't be fooled...although I arranged these cute little polenta stacks for the picture, when it came time to eat them, I mixed it all up in a bowl with some more cheese and sour cream. Whatever route you choose to take to eat them doesn't really matter---stack them prettily and serve them as appetizers or mash them up for a big bowl of Mexican goodness. The ingredients here are nothing crazy, but they are a nice change from the usual tacos, enchiladas, or quesadillas. Polenta is pretty much a blank slate. Although it has a definite taste of corn, it's bland enough to pair with just about any ingredient you'd like. 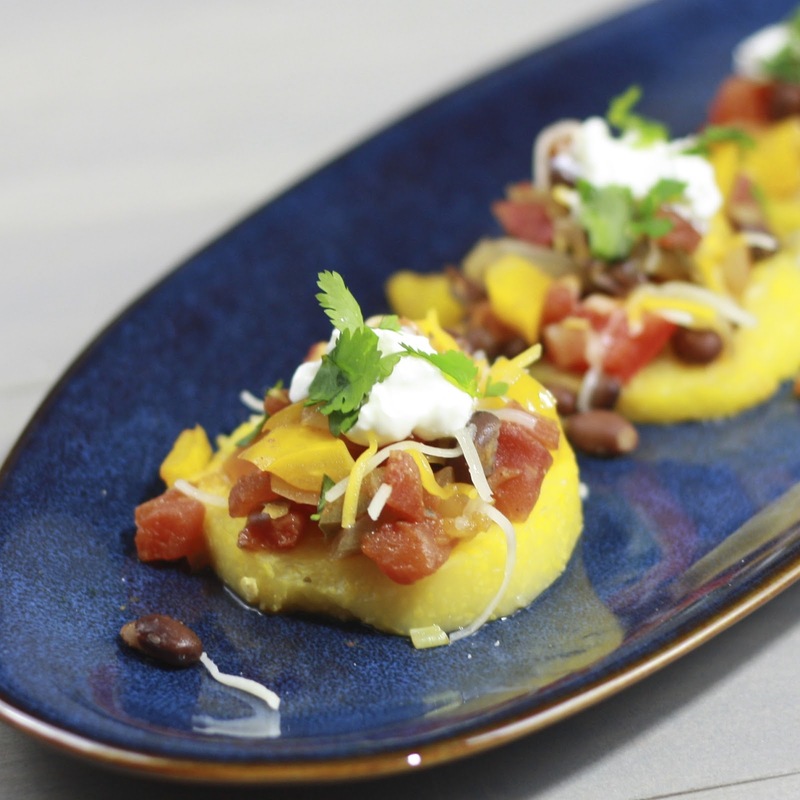 Make pizza stacks or Greek stacks if Mexican polenta stacks aren't your thing! 1. Heat olive oil in a medium saucepan over medium high heat. Add onion and peppers and saute for 7-10 minutes, until onions are translucent. Add cumin and chili powder and cook for an additional minute. Stir in black beans and tomatoes and cook over medium-low, until heated through. 2. Line a baking sheet with foil and spray with cooking spray. Cut polenta into 1/2-inch thick slices and place on prepared pan. Bake at 375F for 15 minutes. 3. Top polenta slices with bean and vegetable mixture. Sprinkle with cheese and serve with cilantro and sour cream.